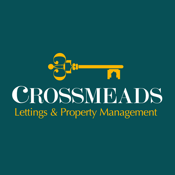 Crossmeads is an innovative and dynamic Lettings Specialist that wants to make a difference. We pride ourselves in ensuring that every staff member is ARLA (Association of Residential Letting Agents) qualified offering a personalised service. Crossmeads is driven to do business efficiently to give you the edge. One of our key features is providing advanced methods of rent collection and Crossmeads have developed an online payment process making it possible to receive rents 24 hours a day, 7 days a week and 365 days a year.